This week marked the 3-year anniversary of Project Bamboo Workshop 1b in Chicago, which kicked off my involvement with the project that would be the defining project for the next year and a half of my life. The project started with a focus on cyberinfrastructure and tools, but the Workshop 1 series "listening tour" made it clear that these things were far from the minds of many faculty, who were more concerned about how to find people, projects, tools, and content. They wanted to demonstrate the value of digital humanities to skeptical colleagues, and fight for the legitimacy of their digital humanities projects within the tenure and review process. They wanted to engage tech-curious undergraduates so they might consider majoring in the Humanities rather than Computer Science, and create an environment where it would be safe for graduate students to reach beyond traditional printed articles to disseminate their scholarship. Having useful tools interoperate better would be nice, but how useful would it be to a lone digital humanist at a liberal arts college, without anyone to collaborate with, whose colleagues are skeptical of his methodologies and who needs to find a way to incorporate digital tools into a course on Henry James? When developing "future directions" for Bamboo to present at Workshop 2, our continuing focus on the technology was evident in spite of our inclusion of "Social Networking" and "Education" components. Our diagrams of service stacks failed to resonate with them and, feeling excluded from the "community" doing the "design", they called for the inclusion of what was initially called the "Stories" working group, later renamed to "Scholarly Narratives". This movement to shift the focus away from tools and towards enabling digital humanities scholarship through a variety of means, technical and otherwise, became a powerful force in the project during Workshops 3-5. I've gone through all the public notes, working group comment threads, and scholarly narratives collected during Workshops 1-5, organized them thematically, and posted them all for anyone to read. While they provide a rich view of the conversations, insights, and needs expressed during the workshops, they are the proverbial trees, and that collection of the data makes it hard to see how various themes were manifested at different points in the project. To that end, I've put together the chart above, and the brief summary of the major themes that follows. the Bamboo Consortium" aspect of the Straw Implementation Proposal discussed at Workshop 3. Sometimes it seemed that Project Bamboo was a digital humanities Rorschach test-- it would solve everyone's problems, but if you asked three people what problems it would solve, you'd hear three different answers. Workshop 1 participants hoped that Bamboo would legitimize digital humanities in the eyes of tenure and review boards, reduce the power of publishers, and increase the number of venues for publishing multimedia content. The advocacy-related themes were captured in a number of community-submitted possible future directions, and presented as a future direction at Workshop 2, "Advocacy: Publication, Academic Recognition, Intellectual Property". As the Workshop 1 participants who were focused on large-scale advocacy were poorly represented at Workshop 2, this direction was tabled indefinitely with little objection. Some of these topics were, to varying extents, incorporated into other areas of work defined during the Bamboo Planning Project. The idea of increasing the uptake of metadata standards can be found in the Direction "A body to further common protocols, standards and principles"; there were some ideas about including "guidelines for tool development to make them intuitive for scholars" as part of the Tool & Content Guide, which was incorporated into the Bamboo Atlas. Increasing the uptake of metadata standards is implicit in the Collections Interoperability area of work in the Bamboo Technology Project, but the remainder of these ideas have little to no influence in the project. The Liberal Arts College participants in the workshops did Project Bamboo a service by continually raising the same questions: "What about undergraduates? How can this be used in the classroom?" Led by two R1 institutions, the Bamboo workshops featured a lot of discussion of research contexts for using tools and content, with far less focus on pedagogy. The Liberal Arts College participants in particular wanted to see Bamboo collect and share good examples of undergraduate curricula making use of digital humanities tools and methodologies, and generally provide support for scholars who want to encourage their students to explore the digital humanities. These concerns were reflected in each step of the Bamboo Planning Project, though not always as prominently as some participants would have liked. The Bamboo Technology Proposal does not address pedagogy. Scholars wanted to be able to leverage knowledge gained through others' previous projects, show their colleagues what was possible through digital humanities tools and methodologies, and learn how to use new tools. Sometimes during the Planning Project, these themes were combined with the themes related to pedagogy, despite some participants' objections that showcasing the best digital humanities research in order to help legitimize the methodologies used was entirely different than teaching an undergraduate course using those methodologies. Scholarly Narratives and Recipes (Workflows) were major manifestations for this theme, eventually combined in the Bamboo Atlas">Bamboo Atlas. Neither the Atlas nor its constituent parts were included in the Bamboo Technology Proposal. One of the most striking things about the Workshop 1 series was how it brought together faculty, librarians, and IT staff from the same institution, who all shared common interests but who had never met before. The impact of those newly-formed relationships was felt in the months that followed, generating interest in finding some way to continue making those kinds of connections and convening en masse to commiserate, contemplate, and tackle shared problems. Scholars also wanted to find some way to connect with faculty members at other institutions-- or even increasing the scope to include independent scholars and the public at large-- who share their interests. To some extent it was already happening on existing social networks, following in-person introductions at conferences; these meetings took place during the last dying days of MySpace, and the rise of Facebook, but before the Digital Humanities Twitter community was as robust as it is today. 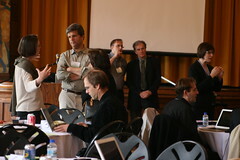 The Scholarly Networking thread in the Bamboo Planning Project involved some degree of infrastructure-building-- as early as the Working Group, there was talk of developing scholar-centric "widgets" or "plug-ins" for existing scholarly networks, rather than building a new network for scholars or relying on existing social network or VRE infrastructure as-is. Between the description of Scholarly Networking in the Bamboo Program Document and the description of the "same thing" in the Bamboo Implementation Proposal, there is a significant shift away from community and towards services and infrastructure. This is most evident in how Scholarly Networking is introduced; in the Program Document, Scholarly Networking is "The virtual place for people to discover, explore, and connect with other people and groups across the Bamboo community. The Bamboo Scholarly Network may be implemented through interconnecting existing social networking tools, including the use of plug-ins and/or widgets based on open interface standards that will allow the Scholarly Network to be easily incorporated into existing portals, virtual research environments, or other research workflow systems and tools. "; in the Bamboo Implementation Proposal, it is described as follows: "In collaboration with institutions, scholarly societies, and other development projects, the Scholarly Networking area of work will create two types of software: a set of small components, which we're calling "gadgets", that will plug in to and enhance existing research environments, social platforms, and collaborative forums; and a group of new services, which will filter information from several sources (including the Atlas) and supply relevant and interesting material to the gadgets." Arguably, this change in focus marks the end of the community-centric "Scholarly Networking" theme from earlier in the project. The idea of social networks as an interface for Bamboo content persists in the Bamboo Technology Proposal, called out as a potential User Interface in the Bamboo Architecture Layers (p. 43), but this is a far cry from the "community building" theme that played a significant role prior to the Bamboo Implementation Proposal. The theme of a "Craigslist for the Digital Humanities" was uniquely resilient. Originally mentioned in Workshop 1, it was not captured by any of the Future Directions or Working Groups, but strong interest particularly from Liberal Arts Colleges contributed to its inclusion in the Program Document. During Workshop 4, the straw polls indicating interest in various sections of the Program Document showed mixed results for the "Bamboo Exchange". Between Workshop 4 and Workshop 5, Rick Peterson of Washington & Lee-- one of the most outspoken proponents of the Exchange-- put together a demonstrator showing how such a system might work, but by that point the Bamboo Exchange had been subsumed into the broad and amorphous Bamboo Atlas. The Bamboo Planning Project began with content, services and platforms, and those threads live on in the Bamboo Technology Proposal. Some phases of the Planning Project brought tools and services closer to the pedagogy, education, and community areas of work. The Tools and Content Partners Working Group aimed to work with the Scholarly Narratives Working Group to distill those narratives into repeatable workflows. The "Tool and Content Guide" in the Program Document would have allowed users "... to both publish information about, and to discover, tools and content sources that are of value for research and teaching." Still, the idea of shared services running on a service platform has persisted, essentially unchanged, from the Bamboo Planning Project Proposal. Similarly, content and tool interoperability find their roots in the Planning Project Proposal. Of the major facets of the Bamboo Technology Proposal, Work Spaces is one of the more interesting to trace. There were relatively little discussion of workspaces as such, in the workshops. After an initial appearance in Workshop 1 (and a nod towards it in the future direction of A Social Networking Tool or Environment for the Arts and Humanities) it fell off the radar for an extended period of time. The Program Document referred to a "Bamboo Community Environment, "where Scholarly Network, Narratives, Recipes, Tools/Content Guide, Educational Materials can be found. The environment may take two general forms: (1) as a user interface that Bamboo develops and is run for the community and/or (2) by developing each of these elements as information widgets/gadgets that can be incorporated into existing Virtual Research and Collaborative Environments." 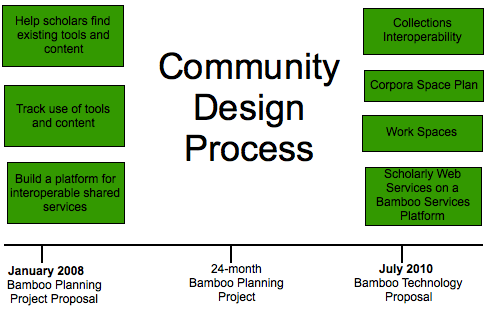 While there's still a discrepancy between the Bamboo Community Environment and the Work Spaces of today's Bamboo Technology Proposal, the Community Environment in the Program Document (along with, arguably, the re-conceived non-community "Scholarly Networking" of the Bamboo Implementation Proposal) is the closest thing to a predecessor for Work Spaces in the Planning Project. What happened to everything else? The Mellon Foundation's merging of the Research in Information Technology Program (RIT)-- which funded the Bamboo Planning Project and was the intended recipient of the Bamboo Implementation Proposal-- with the Scholarly Communications program resulted in a thorough rewrite of the grant proposal. The "human-focused" pieces of community, pedagogy and education were eliminated. Even in the Bamboo Implementation Proposal drafts, these elements were already being sidelined through reframing in the case of Scholarly Networking, and merging everything else into an amorphous Bamboo Atlas. For myself, a lesson learned from the Bamboo Planning Project is that in order to accomplish anything, it's better to refrain from ever talking about doing everything. Be targeted with your scope, and specific with what you plan to accomplish. While the community design process built valuable relationships and produced copious data, it also raised hopes that Bamboo would be a panacea for scholars, librarians and IT staff working in the digital humanities, leading to inevitable disillusionment with the project when it failed to deliver the impossible things it suggested it could do. In his introductory remarks to Workshop 4, Chad Kainz said, "Over time, we'll continue to refer to [the Program Document] and look back on [it]. 'Back in 2008, we had this idea...' Hopefully in 2011 we'll look back at that. Things have changed, but maybe we can evolve that concept." Now, in 2011, looking back on the aspirations laid out in the Program Document, it's heartening to see what has changed, if slowly, and through little or no influence from Project Bamboo. There's a flourishing community of digital humanists on Twitter-- some of whom have met via that medium. DHAnswers is a forum for leveraging others' knowledge, including knowledge gained from previous projects. More and more digital humanities courses are being taught at the undergraduate level. There are active discussions currently underway regarding developing a project registry, a people-and-projects matching service, a virtual digital humanities center, and consultancy/expertise sharing. And Bamboo might be in a position to partner with these projects through a nascent Affiliate/Consortium program. Project Bamboo began with services, platforms and infrastructure, and that's what it's building. If nothing else, the community design process shed light on the state of digital humanities, the challenges and needs of scholars, librarians and IT professionals, and ideas for a path forward. It produced a data set that could be used to make the case for funding initiatives outside the scope of the Bamboo Technology Project, but in the absence of a Bamboo panacea, the future of those threads lies in the hands of the digital humanities community. The data for each stage in the chart was gathered from the Bamboo Planning Project wiki, with the exception of the Bamboo Planning Project Proposal (PDF here) and the Bamboo Technology Project Proposal (PDF). NITLE published a white paper I co-authored with Rebecca Davis, "Divided and Conquered: How Multivarious Isolation Is Suppressing Digital Humanities Scholarship" [pdf], which may be the first publication drawing extensively on the data collected during the Bamboo Planning Project (social isolation of scholars, siloed tools, difficulties involved in finding tools and content, etc.). I spent today doing the last data sorting for the Bamboo Planning Project. When I published the data and summaries on January 1st, I hadn't had time to include the Scholarly Narratives, or data from Workshops 3 and 4. Today, I finished posting the last of the Scholarly Narratives and Workshop 4, which wraps up the Bamboo Planning Project data. I'm considering trawling through the current Bamboo Technology Wiki for additional data at some point. I gave a talk on the Slavic linguistics wiki at the Midwest Slavic Workshop last Friday with Monica Vickers, a first-year grad student at The Ohio State University who used the wiki last quarter in an MA prep class. Slides are available on Google Docs here. One of the concerns I've heard from professors about the wiki is that it provides students with a way to get out of doing their class reading. Interestingly, Monica noted that-- while the students did try that-- the wiki was a great way to refresh your memory about an article you've already read, but was no substitute for doing the reading when it came to giving you the ability to actively participate in a class discussion. For a few months, David Birnbaum and I have been working on a way to batch convert the birchbark letter transcriptions available online into Unicode. We've finally gotten the XML file with the PUA/Unicode correspondences right, and he's mostly done with a clever bit of XSLT to actually do the conversion. 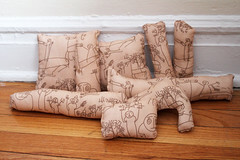 Relatedly, in sewing news, I turned some Spoonflower fabric scraps into giant cuddly oversized birchbark letters. In the last month, I've built a Drupal VRE-style site for a friend working on a project to analyze Facebook posts from Tunisia and the Tunisian diaspora, and I have some sketchy notes for a write-up. At work, I built a Drupal service catalog in less than two hours (if you exclude the 30+ hours spent cleaning up messy data, doing multiple imports, etc.) A write-up is about half done. I'm dabbling with a new site that uses Feeds to pull in weekly reports from major IT projects and display them in a way that's much more accessible than what we currently provide. I'm also working on building a VRE for Bulgarian dialectology that I did a proof-of-concept for in February. Actually doing a batch import of all the pre-existing data from Word files (as opposed to manually entering data, as I did for the proof-of-concept) is going to be a task-- over 7,000 word nodes, plus maybe a thousand sentence nodes, and a handful of others. Getting the data into a form where it can be imported has also been a challenge, between cleaning up inconsistencies and human error, and figuring out the XSLT to pull the right data out of the XHTML generated by Word2CleanHTML. Thanks to Gerry Siarny, there's a proof-of-concept running on Slicehost. A blog post on how to do it will be coming soon. I've come to the realization that Drupal site breakdowns, tutorials, pedagogical materials, and musings are evolving into their own project, and will consume the blog if I don't move them elsewhere. So, I've created a new section of this site to publish and organize things related to using Drupal for higher education. There's a separate RSS feed for it as well. To start with, I have the previously-blogged site breakdown for the virtual research environment I created in 5 hours, and a breakdown for this very site, alongside Drupal jargon explained! 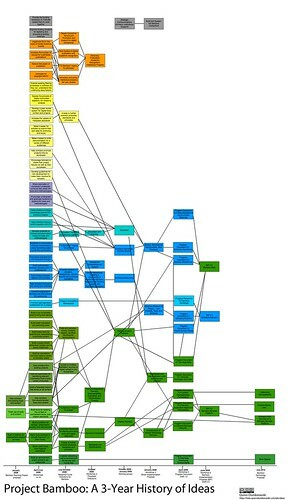 and my notes from Do It With Drupal a few years ago. I've also posted my weekend manifesto, If an institution could support just one tool for teaching and research, it should be Drupal. Cue the firestorm. Note: this post has been moved to the new Drupal-specific section of the site. Read the full post here. Drupal has a reputation for having a steep learning curve, but I remain convinced that it's largely overstated. Nonetheless, it's true that right from the start the new Drupal user has to contend with documentation that uses unfamiliar, arguably non-intuitive jargon. That said, "What's a node in Drupal?" is a harder question to answer than one might think. Because the pieces of Drupal are usually inter-connected, an easier term to define, like "CCK", depends on the reader understanding what a "node" is. The Views documentation might tell you how to create a Block, but without understanding what each of those things is, it's easy to get frustrated. So, for the sake of Drupal newbies who want to like Drupal but are struggling to get past the jargon, I've put together my own attempt at some practical definitions, and a diagram of how the pieces link together, at the bottom. My goal here is to make things clearer for the sort of Drupal site developer who will mostly be using the UI; when having choose between technical accuracy and clarity for practical, hands-on purposes, I've sided with clarity. I've organized it in such a way that, with some exceptions, each definition provides prerequisite information for understanding subsequent definitions.